Princeton physics classes are hard. In a typical week of lectures, a professor will cover around a chapter of material from the textbook. To accompany these lectures, the professor will assign a problem set meant to solidify our understanding of the material and encourage us to apply it in adept, creative ways. These problem sets require a lot of work. An "easy" problem set may take four hours, a difficult one 20 hours or more. Luckily, students are not alone in facing these challenges. Professors are always available at office hours, and it is very common for students to work together on mastering the material. Most physics classes run problem sessions once a week to facilitate this collaboration. Problem sessions are run by TAs, graduate students who assist the professor of a course. Usually, the TA will start the session by reviewing the material the class has covered in the past week. This can be quite helpful, because as graduate students, TAs have learned the material more recently than the professor, and therefore remember which topics they found confusing at first, and how they resolved that confusion. After this review, students will work together on solving that week's problem set. The TA will stay for a few hours, and we can ask her or him questions when we have trouble. The work is quite collaborative and very enthusiastic. This part of problem sessions is in fact one of my favorite parts of being a physics major. As I talk with other students about the week's problems, concepts that were previously unclear gradually come into focus. We also love to work problems on blackboards. There's something about drawing and doing math on a blackboard while talking with others that makes one feel like a real physicist. 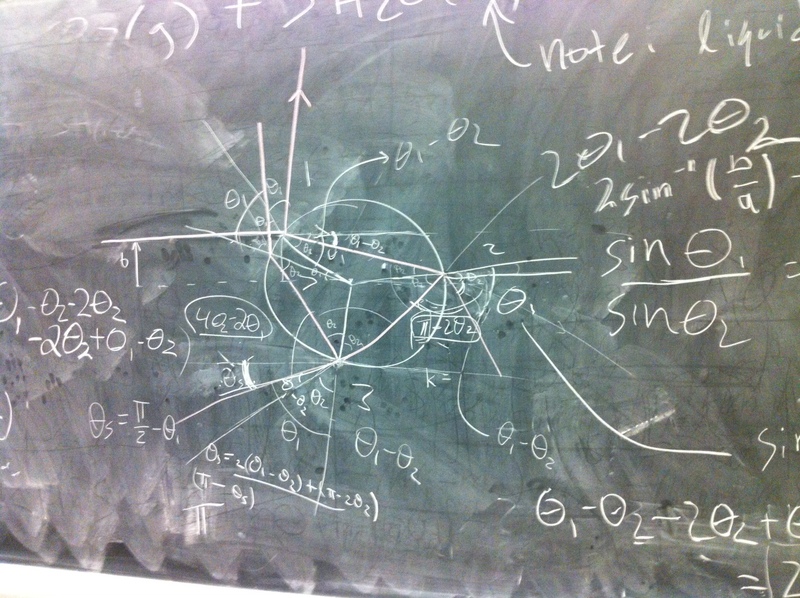 These blackboards can become quite messy, however, as we realize what we've done wrong and write corrections nearby. I've included some images of problem session work so that you can get a sense of what we do.